One of the agreeable opportunities afforded me in my time away in foreign parts, where for much of the time I could be more or less do what I pleased, as other demands on me were limited, was being able to view two video series I have long been interested in but not seen in their entirety, which I had downloaded to my lap top just prior to leaving, anticipating I might find time to watch all the episodes, which as it turned out was the case. The series in question were Carl Sagan’s “Cosmos: A Personal Voyage”, thirteen one hour episodes, and Thames Television’s “The World at War”, twenty six one hour episodes. While these are quite different, they both covered distinct areas of interest for me, and while dated insofar they were both produced in the 1970’s, yet nearly forty years on both productions come across as surprisingly modern and even prophetic as they looked ahead at what might be. Both were in my view excellent productions, and given their popularity, which continues to this day, clearly others think so too. As those who follow such things, Carl Sagan is a famous scientist, particularly in the area of cosmology, and his work to communicate scientific ideas and to popularise science has received much acclaim. I can recall coming across Sagan as a young man but after that had not given him much thought. While I have no doubt he had his own agenda for producing this series, amassing around him a formidable production team, but I was left in no doubt that his motivation was mostly to understand how as humans we try to come to terms with this awesome cosmos in which we form such a tiny part. My motives for viewing “Cosmos” were three fold. My science interested son had recommended it and I need to understand his world; I wonder at the Cosmos and the longing of those who want to harness knowledge to do good and want to know more about the science that tries to explain it and I had heard Sagan was a bane to religious fundamentalists and I wanted to know why. While Sagan’s opening comments, “the Cosmos is all that or ever was or ever will be” is something I may wish to qualify with my own personal, spiritual perspective, his infectious desire to probe the mysteries contained therein made we want to hear more of what it was that he had to say, and I was not disappointed, despite being a little sceptical as to his optimism that the human spirit will conquer ignorance and with the right encouragement will continue to gain knowledge and overcome all barriers to making progress.While I would like to think that as we become more enlightened we as the human race will make progress, I believe history shows otherwise and I fear the human condition which fails to discharge our responsibilities will hold us back if we discount God, an entity Sagan sees as unhelpful superstition. While there was a lot of material covered that I was already aware of and science has moved on considerably in terms of discoveries made since Sagan made his programs, I learnt a lot and was captivated, not just about the science that explains how the universe functions, which we were left in no doubt was no adjective can do justice to big and amazing, but also the history of ideas going back thousands of years that encouraged or discouraged scientific endeavour, leaving me with even greater respect for those who made it their lifetime mission to find out more. It left me humbled and wanting to know more, e.g. regarding the science of how universes come into being and then end, and later to give rise to new universes, and the laws of science that governed this. Historically, I was fascinated by things like the library of Alexander which was a seat of learning in the Ancient world as well as being seen as a threat and later to be destroyed as many an antiquity has been. While Sagan tried to offer a coherent understanding on how the theory of everything, admitting to gaps in knowledge, for me it added a sense of wonder and my wishing I was a scientist again. I kept coming back to the notion of Earth being a barely significant planet among a mind boggling large number, separated by incredibly large distances in a cosmos we know so little about. Sagan did well to provide a proper perspective and raise all sorts of fascinating and often fundamental questions such as those around origin, nature and change. It was interesting to see how science was opposed and also how those devoted to science could be oblivious to the needs of humanity and social injustice, e.g. slavery, and yet science also was to benefit humanity greatly as we know. On the religious front, those of that ilk did not come out well, for as far as Sagan was concerned religion opposed science at every turn and, sadly, in many cases he was probably right. While I might take issue with some of his ideas as to how the universe came into being, he saw as a product of pure mechanism and chance with no orchestration, ignoring intelligent design and purpose altogether, there was little else I could disagree with. While I think I know where Sagan was coming from regarding how life began, it begs many a question, including the ever fascinating one of what other life is there in this universe? As far as Sagan was concerned, we (humans) are clearly not alone and the quest to discover other life remains, as does furthering our understanding of the universe we inhabit, thirsting to augment our meagre understanding and be able to control our destiny. Regarding, the Second World War, I have to declare an interest. I have long been fascinated by the events associated with that war and have done a lot of study concerning these. As for the World at War series, this was ground breaking television, designed to tell a story in a compelling and fresh way that attracts all sorts, including a new generation that were not in the War. Having been brought up looking back on the War through English eyes, it was good to see the balanced approach and the recognition of the significance of the part played by many other countries. While the war in Europe was the central focus, the series did well to cover other parts of the world affected. What I found impressive is what it set out to achieve. It sought to cover the main events, incorporating various perspectives, give the relevant background, reflect on the outcomes and while it tended to take the just war approach it tried to take a view that is as neutral as it is possible. It employed many talents and having Laurence Olivier doing the narration was a master stroke. It did not talk down to the audience and used original footage as far as possible divorcing it from the propaganda element or else pointing it out in order to tell the story. One highlight was getting those who were there playing a part in the War from all sides, ranging from the main leaders or those close to them to the “ordinary” people, to tell their story, which they did most effectively. I reckon the result is something that widely appeals to them with all sorts of views. I was left in no doubt that the World of War largely achieved what it set out to do and while a lot of coverage was tantalisingly missing because of time limits, what it managed to cram into twenty six hours, although never rushed, from the enormous selection of archive material available that had be painstakingly sifted through, on top of the many interviews made, was entirely appropriate and was as comprehensive as you could get it. Despite already knowing a lot, I learnt a lot more. I already knew war is terrible but sometimes unavoidable to protect against tyranny. I already knew that practically every one from my parents generation who lived through World War 2 were deeply affected by it. The videos merely confirmed this understanding and begun to explain. Viewing the all too human story that unfolded provided a perspective I was previously unaware. It was obvious with the benefit of hindsight many mistakes were made from both sides and I couldn’t help but ask the question what could have been. Looking back, it is easy to see now how many a disaster could and should have been avoided. It was also worth taking note on human fallibility and even those we hero worship, like Churchill, were not immune. As for the movers and shakers of the period, they really were a mixture of fools, villains and good guys. I couldn’t help thinking, not much has changed! What is obvious is in total war, as this was, it truly covers the whole world, affecting all, and all aspects of life, military and civilian, and we see life in the raw, ranging from evil and tragic to good and triumphant. Some of that evil was unimaginable e.g. genocide and the way prisoners could be treated e.g. allied troops by the Japanese and Russians by the Germans. Reflecting on the over fifty million lives lost and the many times that number greatly affected was salutary. I found watching the various episodes, each devoted to a single aspect or set of events in the war, to be captivating and sobering and instructive viewing. I also sensed it had played an important part in my understanding of the world I now live in. One very recent thought concerns the European Union that in the UK we have voted to leave – seeing the series made me realise why some of the European nations are keen on the idea – peace as opposed to war has to be an attractive idea. It is unlikely that if I hadn’t made my overseas trip and allowed the luxury to check out things I might not otherwise manage to do, I would not have been able to view Cosmos and the World at War. I am glad I did and have no hesitation in recommending viewing to any who are interested. 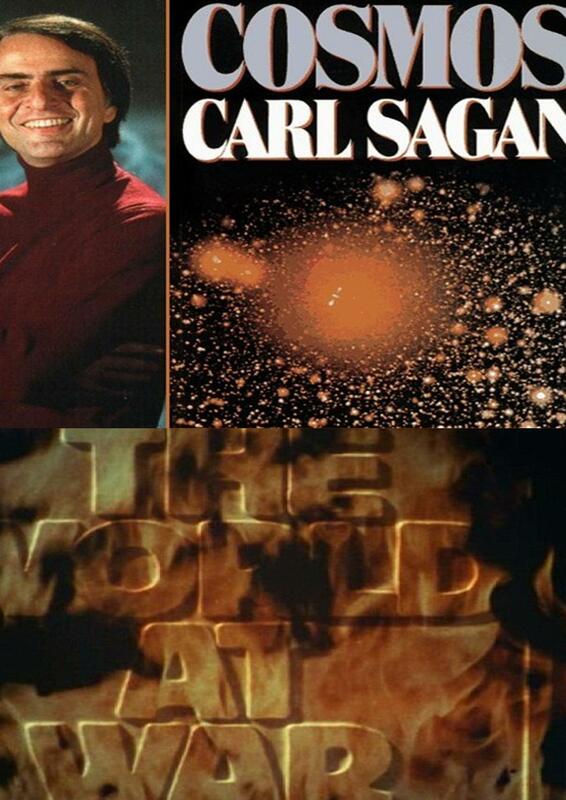 Carl Sagan and Jeremy Isaacs (the producer of World at War) are to be commended. I just hope that as a man of faith, I can do my part in encouraging scientific endeavour and honest enquiry and seeing the best and worst in human nature, will always side with the best and withstand the worst.